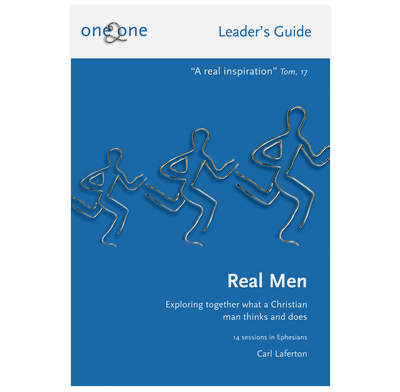 A free guide to leading One 2 One: Real Men. Welcome to the online Leader’s Guide which accompanies the Real Men One2One Bible-study booklet on Ephesians. Below, you’ll find an introduction to this guide, and downloadable pdfs for each study. There’s also a pdf which contains the guide for all the studies. Was recommended this book for mentoring a young Christian man. Very good book. Very quickly received. In use now. Have used this booklet several times as a mentoring aid and it has worked well even with those who are poor readers. The variety of approaches has managed to hold the attention most of the time. There have been real moments of enlightenment (eg a 14 year old really understanding Grace). A good well balanced booklet to help young men grow in their faith. Highly recommended. Excellent resource. Refreshing presentation with engaging and clear questions. Simple yet profound. Solidly biblical. Highly suitable and very helpful for guy teens. Easy for leader to use as well. Hope to see more of such materials on more topics. Currently using this with a couple of g15 year old guys in the youth group that I lead. Really great resource for discipling young guys and helping them understand doctrines. Highly Recommended!